TEL AVIV – Israel and the United States signed a cyber defense declaration Tuesday calling for real-time operational connectivity through respective Computer Emergency Response Teams (CERTS) of both nations. 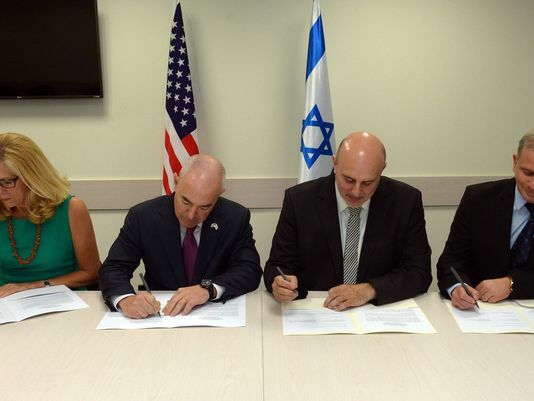 The declaration of intent, announced during the annual Cyber Week at Tel Aviv University, was signed by Eviatar Matania, head of the Israel National Cyber Directorate (NCD) and Alejandro Mayorkas, deputy secretary of the US Department for Homeland Security (DHS). Direct responsibility for the planned bilateral cyber defense operations will come under Suzanne Spaulding, DHS undersecretary for national protection and programs, and Buki Carmeli, head of the Israel National Cyber Authority, who also signed the accord. “The declaration expresses the criticality of joining forces between countries for the benefit of dealing effectively with common threats in the cyber domain. In particular, [it expresses] the obligation of the governments of Israel and the US to broaden and deepen bilateral cooperation in the field of cyber defense,” noted a statement by the Israeli Prime Minister’s Office, which overseas activities of the NCD.